Google is undoubted the number one search engine around the world. Indeed it is also the most visited website. The story of Google is something that is not a magic. It is a product of certain individuals with passion for change. Any brand with enough commitment, courage, teamwork and dedication can replicate this achievement. Google is currently spreading its tentacle around the world. Africa is becoming a major target and Nigeria and Kenya are on Google’s radar now. December 7, 2011, Google Nigeria organized a two-in-one event. 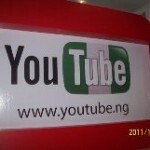 It was the deal day for the launch of localized Youtube-Nigeria version. But to herald this, Google Nigeria organized a Content producers’ workshop for frontline Nigeria content producers in Lagos. I had the privileged of been invited to attend and I must commend Google Nigeria team led by Juliet Ehimuan for a great job delivered. We had about two major sessions with other two break-out sessions. The speakers include Walker Patrick-Senior Director for Europe Middle East and Africa, Anat Amir- Marketing Manager Africa, Lanre Aina and Affiong of Google Nigeria team. Here are my takeaways. Broadcast yourself: Every one now has a great opportunity in making his/her voice heard. No one has a valid excuse as long as he/she has access to the net. The net offers everyone the key to enhance personal goodwill. Broadcast your brand: Every brand and especially small and medium scale can now enjoy global influence if the custodians are willing to flow with time. Though going viral and becoming a global influence will requires strategy but most of these strategies are opened to all. Increase and monitor influence: participation and use of tools like Youtube may be good, but ability to measure results delivered. Basic understanding and applications of how certain Apps work will increase ROI. Internet and Social Change: Many are complaining about what irritate them and most do nothing. They hope for dramatic changes through magic. Many hpe and wish they will one day wake up to find out that issues that touch them will vanish. It is time to wake up from slumber. YouTube and other Social Media tools are now available to everyone, Non-profit organization, citizen Journalism to create changes they desire. I remembered speaking about this at REVOLUTION 2011, a gathering of youth in Lagos. Whatever we do with our lives and brands will no longer be judged by how much we have but how much impact we are able to make. Money is no longer an excuse. More than ever before passion, willingness to stay on as well as work hard in building a strong community around our cause will determine whether we (our brands) will be remembered tomorrow. The web is now an open slate. Embrace the internet tools- Youtube, LinkedIN,FaceBook- to reach, research and increase brand revenue. It is up to you. We can write and make history. How well are you tapping the goldmine on the web? Share your idea. You have to waste less time to search your required topic on internet, because nowadays the searching strategies of search engines are nice. That’s why I fount this article here. Love the post, have to do some more research ont he subject though. Asking questions are in fact good thing if you are not understanding something fully, but this piece of writing gives good understanding yet. One more thing that I want to share here is that, whatever you are using free blogging service but if you don’t update your blog on regularly basis then it’s no more worth.